Sigmund is complete, and some words should be said over Sigmund. It sounds like he’s dead, because pots do die for me for a while after the last touch. If they are strong pieces they will resurrect themselves in my imagination years from now, when I can’t possibly remember how I made them (except in my muscles somewhere). After the Blue Bottle from 7 years ago, I stopped this trajectory of thought only to pick it up again in Sigmund. It was so new and complete an expression as I started to make my sea monster. But it began to crumble as I painted it with oils. The exits and entries felt forced and incomplete– when they had felt so fluid when in the wet stage. Fortunately I got lost in the painting process as I thought about Monet’s Water Lilies series– tickled that I had somehow painted pond water on my pot. The final stage of modpodge killed it again. It was now just a shiny mess of suggestive holes with too obvious sutures. This is when I started calling it Sigmund. The only way to evaporate the sense of disappointment is to make another pot. 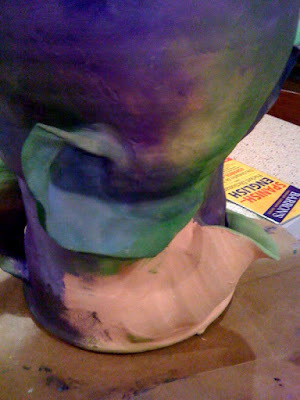 Next time: spend more time thinking through the holes so it can’t be compared to a strawberry pot, exorcise the ghost of Georgia O’Keeffe, spend more time molding the “ears” to make them feel more fluidly organic, paint it without modpodge? I won’t know exactly until I am again possessed to plunge through the whole process again. The key is not to be too worried about pieces from the past– not just mine but those of teachers as well. This is why commission work can be the best for an artist. Once it is in the client’s hands, you can no longer worry about it. Linus didn’t commission this piece, but it is most definitely his. Looking at the chick-shaped shadows the monster casts on his ceiling as I sing him to sleep each night, I will forget the frustration that is a completed and dead work.